What Is Fat Back (AKA Fatback)? Fatback, much as it sounds, is the fat from the back of a pig. It is a "hard fat" that can be chopped and ground. As such, fatback is a key ingredient in many sausages to add flavor and juiciness. The extra fat fatback adds to sausages is what makes sausages have the rich taste and texture. 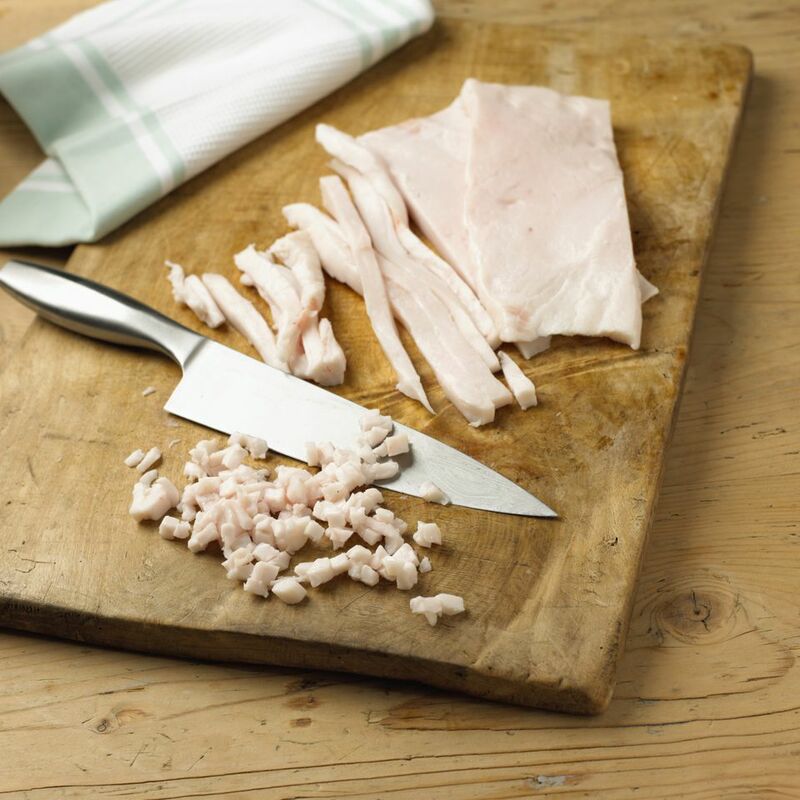 Although fatback is solid at room temperature, it is easier to chop or grind if it's been well chilled - even a quick 15-minute stop in the freezer can help it keep its shape as you work with it, especially when grinding it for sausage. Note: When making sausage, it's best to chop the fatback and the meat, put the pieces in the freezer for 10 - 15 minutes, and grind them together—the fatback on its own is more likely to stop up the grinding plates. Fatback can be added to any dish using ground meat for additional flavor and moisture. It can add juiciness to burgers, meatloaves, and stuffing, as well as other dishes featuring ground meat. Note, however, that fat back has a rather high water content. This can aid in a juicy factor, but it can also cause shrinkage in items like burgers or meat loaves if too much fatback is used or the dish is overcooked. What's the Difference Between Fatback and Lard? Fatback is pork fat from a butchered pig, while lard is pork fat that has been rendered—or melted and strained—before being allowed to cool and solidify again. The rendering process makes lard smooth and scoopable, with a texture more like butter, while fatback is more solid like meat. For that reason, fatback and lard, although they are both pure pork fat, are not interchangeable. Adding lard to a sausage recipe in place of fatback would lead to a giant mess, and there is no way to "work" fatback into a pie dough in place of lard. Fatback can, however, be melted, strained, and turned into lard, if you're up for an old-school do-it-yourself project. If you do this, know that you need to keep the resulting lard in the fridge or freezer, since it won't be shelf-stable the way blocks of hydrogenated lard for sale at markets. While fatback can be rendered into lard, the result is less prized than the more delicate leaf lard rendered from the "soft fat" that comes from the abdominal cavity. Lard from fatback will have a more notable pork flavor than leaf lard does. What's the Difference Between Fatback and Salt Pork? Fatback is also sometimes used to refer to salt pork. True salt pork is fatback that has been salted and cured to prolong its shelf-life. Salt pork is an important ingredient in southern cooking, adding flavor and juiciness to greens and other dishes. It was also a standard provision in pioneer larders in the 19th century, since it was relatively cheap, kept well, added flavor to meals, and provided an easily portable cooking fat. Is There a Difference Between Spanish and Mexican Rice? What Is File Powder and How Is It Used in Recipes?